Like a Baby in a Storm aka Wear Me, Lord! We had just parted ways with our little buddies at the library. I was wearing Ellis in a baby carrier against my warm and plush torso so that he can fall asleep though overtired, way past his naptime. 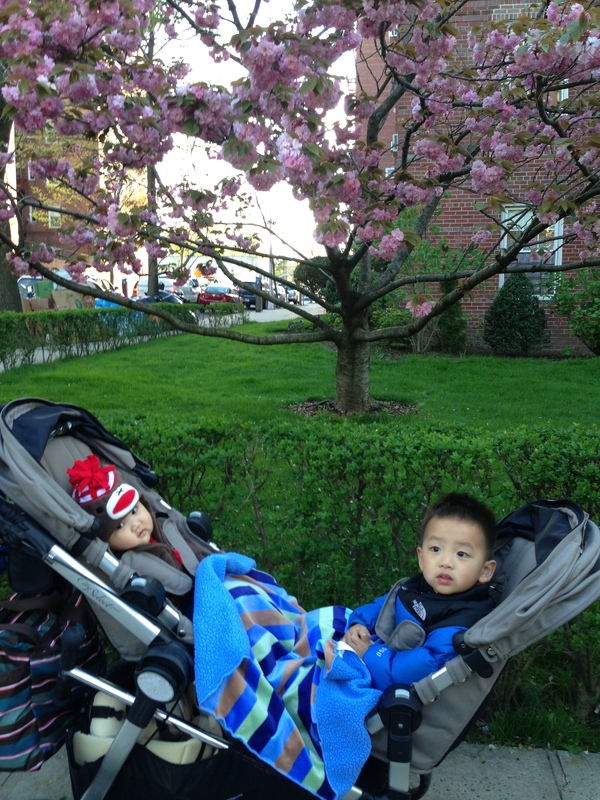 Mr. EZ Kim had graciously given up a proper nap in his crib yet again in order to accompany his big brother to his Wednesday activity. Secondborn’s lot in life. On the way home, the raindrops that initially fell intermittently from the trees started coming down faster and even fatter. Micah was sitting in the double stroller, facing me, Ellis still on my body, his seat empty. I adjusted the raincover for their stroller accordingly but it was pouring so furiously that a pool of water was already gathering at the bottom of both seats. Micah pleaded with me to take off the raincover as it was annoying him. This was going to be a long walk home. I pleaded back with him to please please just be patient as we had many blocks to go. I was carrying an umbrella, wearing Ellis, fidgeting with the wet, steamy raincover, trying to stroll as fast as I could when the front wheels started locking so that I could not maneuver them. Locking every other step I took. So I would have to crouch down, wearing Ellis, blinking through the rain, trying to figure out why it kept locking on us. Thunder. Lightning. So loud that car alarms started going off in succession in the parking lot of a funeral home, and up and down Queens Blvd. Micah asked for snacks in the midst of all this. I pleaded with him again to please be patient as Mommy could not reach down and rummage through for a snack of his choice. Toddlers are not too compassionate during a harried moment. My stomach was grumbling from hunger. Passersby looked at me trying to get our little crew home safely as they waited under awnings. I thought about seeking refuge under a bodega awning or at the Chinese restaurant our friends are grossed out by due to the “C” grade, but I was nervous that Micah would get restless and demand to walk. I would rather deal with the storm than a tantrum. Drivers snug in their cars watched us, too, as we were quite a spectacle. Because I was wearing Ellis and Micah was seated in the seat closest to me, it looked like I had three kids with me. Ellis stirred awake. I was nervous that he would cry from hunger or from being startled by the elements. Instead, he looked around, looked up right at me and smiled a gummy smile. He sighed with content as he watched the outside world, hanging from my shoulders. By looking at his serene face, you would not know that we were walking clumsily through a crazy storm. At that very moment, like J. Lo said about her second husband, Chris Judd, in an Oprah interview shortly before their divorce, he was my peace. When I got home, I had to towel myself dry and catch my breath. Thankfully, the kids were dry and my phone had kept Micah from bombarding me with any more requests. I WAS FAMISHED but diapers don’t change themselves. I wanted to transport myself to the Grand Canyon to belt out all the stress of that moment, deep from within my gut. Not just that moment but other storms that have been raging within me for months now. I wanted to be as loud as that thunder and lightning we had just walked through. Set off car alarms. If I had been able to write this post immediately after that storm, I would’ve ended it here. Just a scene from our week. TGIF, whatever. 2) how they didn’t bat an eye through the loudest of storms because MOMMY WAS WITH THEM! Ellis looked like we were taking a stroll on a perfect day like today. What a beautiful and innocent stage they are in. Nothing is troubling as long as Mommy is here! I’m thankful for this new visual I can use when I pray to my Lord and Savior. I will conjure up Ellis’ face in the midst of that storm as I pray through my own struggles. To trust that I don’t have to be afraid. This entry was posted in from the parenting trenches, these are the days of our lives and tagged like a baby in a storm, memories by ajummama. Bookmark the permalink.